While Andy was overseas Jane Duncan was a dutiful wife. She took an interest in the newspaper reports of the Gallipoli campaign and later the Western Front. She clipped newspaper articles for Andy to read when he returned home. Elizabeth Jane Duncan nee Stewart c. 1918. From the author’s collection. Copyright Andrew Palmer. Jane wrote regularly to the Department of Defence, advising frequent changes of address and seeking updates on Andy’s situation. She also wrote to the newspapers in Broken Hill, Adelaide and Melbourne to share any news from the front. 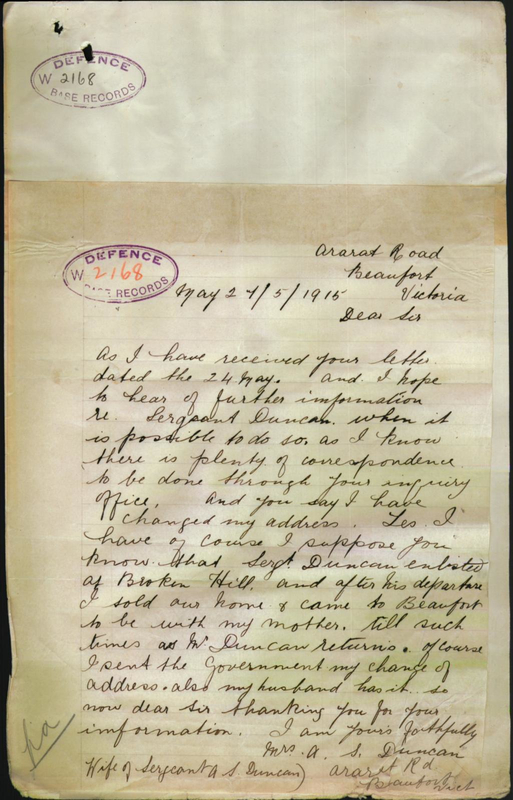 Jane Duncan’s letter to the Department of Defence, 27 May 1915. To be with my mother. Not her father? Family memories suggest that Jane and her father, John Stewart, only got along in small doses. Jane’s relationship was with her mother. It wasn’t long until Jane’s free spirit saw her leave Beaufort again, though she returned regularly to her parents’ home. Jane’s letters to the Department of Defence record her travels. • In August 1916 she was in Broken Hill “for a month or two”, staying with friends. • On 24 October 1916 she changed her address to Beaufort, “as I have left Broken Hill & have returned to Victoria”. • In April 1917 Jane wrote, “I am in Sydney for a few months” and gave her address as 146 Flinders Street, Moore Park, Darlinghurst. • By 31 January 1918 Jane was lodging at the Dunolly Coffee Palace and planning to stay “for some considerable time”. • On 5 April 1918 Jane was back in Beaufort, but by mid-May she was residing at 11 Victoria Road, Malvern with her aunt, Elizabeth Anne Downes White (nee Stewart). Jane stayed in Malvern until news came of Andy’s repatriation to England in January 1919, then she returned to Beaufort for a month or so. • By 11 March 1918 she was in Bung Bong, near Maryborough. It is possible that Jane’s travels to Dunolly and Bung Bong were associated with family, as the Whites and the Stewarts were mining families with connections to the central Victorian goldfields. • The Riponshire Advocate of 29 June 1918 reported that Jane was in Banyena. • On 19 April 1919 Jane wrote to advise that she would be leaving Bung Bong for Beaufort and requested any further news of Andy be sent to the Stewart home. 1918 ‘FOR THE EMPIRE.’, Riponshire Advocate (Vic. : 1914 – 1918), 29 June, p. 2.